The decision to make artworks that relates to here and now steams from a belief that art should not seek out a complacent ‘disinterested’ aesthetic autonomy, free from social and political responsibilities, but that it should instead address the time and space of its ontological being. Border Land (2000-2008) is an ongoing project that grew out of the visible and often less visible, geographic, cultural and military borders of the city of Jerusalem and beyond. In 1998, I created Jerusalem 1998, a puzzle which, like the city, still bears the scars of its inner fragmentation, even after all its pieces are put together. In 1996 I had already used a telescope in Temporary Observation Point (The Bridge) to express the alienation I sensed between the Western and Eastern part of the city. Fulfilling the naive function of tourist sightseeing while recalling military posts scattered along borders, the telescope offered any Arab or Israeli stroller scopic mastery at safe distance. Working with an atlas of road maps in 2000 sharpened the alienated “Elsewhere” present on the map and yet transparent to most Israelis civilians. The intensification of the Second Intifada, and the political instability repeatedly confronted me with the meaning of doing art as I concealed in Hidden Maps roads of Jerusalem’s borderline, in a secret reminder that reality could not totally be exorcise from art. While terror attacks became a daily routine, I started Road Map #1, a road map which showed both the industrial zone of Talpiyot where my studio is located and Beit Safafa which minaret I can see from my windows. As I drew the lines of the maps and wrote the names of Arab Israeli/Palestinian villages I never entered, I became more aware of a structural absence right in the centre of the maps. I also noticed that the roads lines of the Arab villages/towns never intersected with those of the Israeli neighbourhoods, a physical separation I enhanced in the Road Maps series. In these diptychs, Palestinian and Israeli neighbourhoods are bound together through an absence/ presence structural resonance. Simultaneously, trying to push further away the boundaries of my own alienation, I moved from the abstract lines of cartographical maps into a more concrete reality, documenting with my camera the harsh reality of the fences and checkpoints erected at the edge of the city, creating the series of the Jerusalem Scrolls. Subsequent trips into the alienated landscapes of borders also influenced the installation, Behind The Wall, deliberately created behind the gallery temporary partition walls and using huge amounts of olive pits turned black and rusted discarded construction site elements. In 2003, the field became both my studio and a place of work. In order to better have a sense of the conflict I became a freelance news photographer which allowed me to cross borders and enter Palestinian territories, where the points of friction occurring between Palestinians and Israeli soldiers are mainly witnessed by the media. In the summer 2005 I covered the Disengagement from the Gaza Strip . In May 2002 I had started a dialogue with my colleague and friend Hannan Abu Hussein and we first exhibited in Scar and then worked together on several projects. 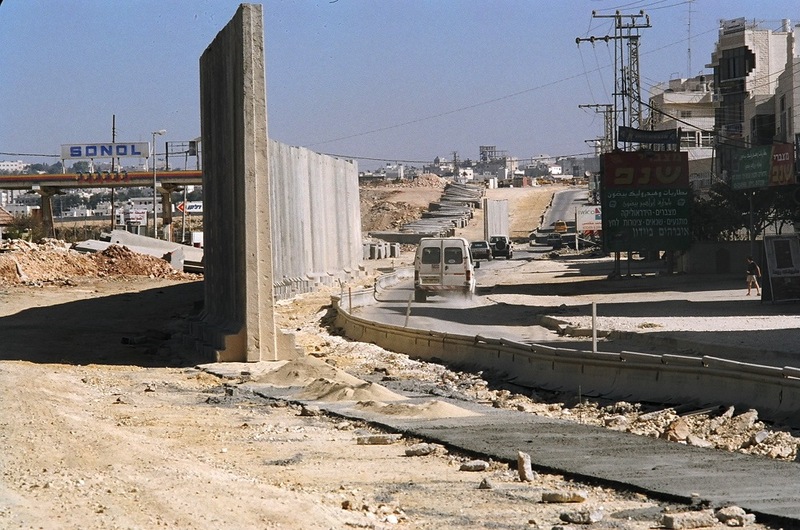 In 2003 we created an exact replica of the road blocks of the Abu Dis Wall which we exhibited at the David Citadel, a museum located at the entrance of the Old City. Our Mobile Abu Dis Wall, echoing the real Abu Dis Wall, functioned both as a physical obstruction to the flow of visitors and as a semiotic interruption in the museum historical narrative that ended with the ‘re-unification’ of the city in 1967. While furthering my walking into and beyond the borderline, together with my colleague Irit Amar, I performed at Heara 8 – Comments on Hospitals & Schools, a seven hour Surgical Operation on Closure Maps showing checkpoints and road networks of the Jerusalem region located beyond the Green Line. These maps were dissected and meticulously sewed with green threads or patched with plaster bandages amid breaking TV and radio news recorded during the Second Intifada, in a vain effort to cure the city from its pathologic chronic violence. Two years later, in a performance presented at Heara 10 – Comments on the Israeli Acropolis in the Sciences Museum, a segment of a map of Jerusalem compiled, drawn and printed in 1947 by the Survey of Palestine was screened unto the floor. On this map the name Esh Sheikh Badr still appeared, a neighbourhood renamed Ramat Haqirya on the map revised by the Survey of Israel in 1955. Working together with Hannan Abu Hussein and Maya Yogel, Erasure became an existential act of exhuming forgotten names, forgotten memories, forgotten pains and frustrations while re enacting basic forgotten feminine gestures. In the same exhibition I exhibited together with Reuven Zahavi, Donald Duck’s Dream, a joint multimedia and interactive project over the manipulative regime of images. In the midst of the Disengagement from the Gaza Strip and later on, we felt that the Disengagement Operation had turned into a huge spectacle, with images of the enforced evacuation of more than 8000 Israeli civilians by police and army forces flooding TV screens, radio and written press. It became a highly emotional imagery often linked in manipulative ways to previous collective memories, undermining for a while the importance of that historical redeployment which concluded a period of over 38 years of military Israeli presence in the Gaza Strip. But eventually the swift territorial disappearance of the Gaza Strip was accompanied by the general wish of the Israeli public to erase from their memory the emotional turmoil of those images. Our work proposed a critical and altered circulation of images, texts and sounds in an attempt to infuse artistic autonomy unto these extremely saturated images and texts.